Dental plaque is a microbial biofilm that naturally forms on the tooth surface. It is a blend of saliva and food particles that are in your mouth. Plaque forms all over your mouth, but it tends to accumulate along the rim of your teeth and gums and in the molars' grooves and crevices. When you consume food and drink, the bacteria in plaque use the sugars in your food to produce acids that can eat away at your tooth enamel. Biofilms, such as dental plaque, are highly diverse microbial communities, meaning they are especially resistant to antimicrobial agents, such as mouthwash. If you do not remove plaque regularly, it can lead to tooth decay. Tooth decay can lead to tooth abscesses, and if the plaque develops on the tooth roots under the gum line, the acids can damage the bone that supports the tooth. 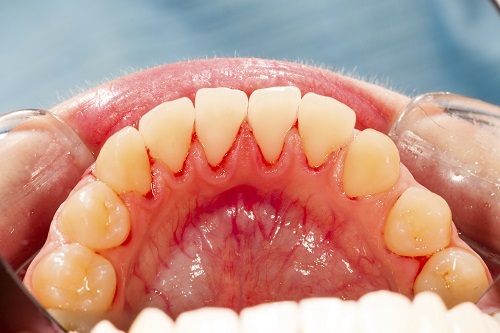 Dental plaque that has remained near the gum line can also lead to gingivitis, which is a mild form of gum disease, and that can be an initial step toward a more serious gum disease known as periodontitis. Plaque starts off soft and easy to remove, but if left in place, it will dry and become difficult to remove. Hardened plaque is known as tartar or calculus. How Do I Remove Plaque? Removing plaque needs to be part of your normal daily routine. Brushing twice a day, and flossing before you retire to bed, is the best way to keep plaque at bay. To do this, be conscious in your brushing of your goal to remove plaque. Brush purposefully along the tooth and gum ridge, where plaque is most likely to collect. Be aware of your molars natural grooves and crevices, consciously brush deeply into them. Floss between each tooth shaping your dental floss in a "C" shape, not just an up and down motion. We want you to work the plaque out with a scooping motion. Daily awareness of plaque and its removal will help keep your teeth healthy. So please contact us today to help protect your smile from plaque.